There comes a day when every streak must come to an end. 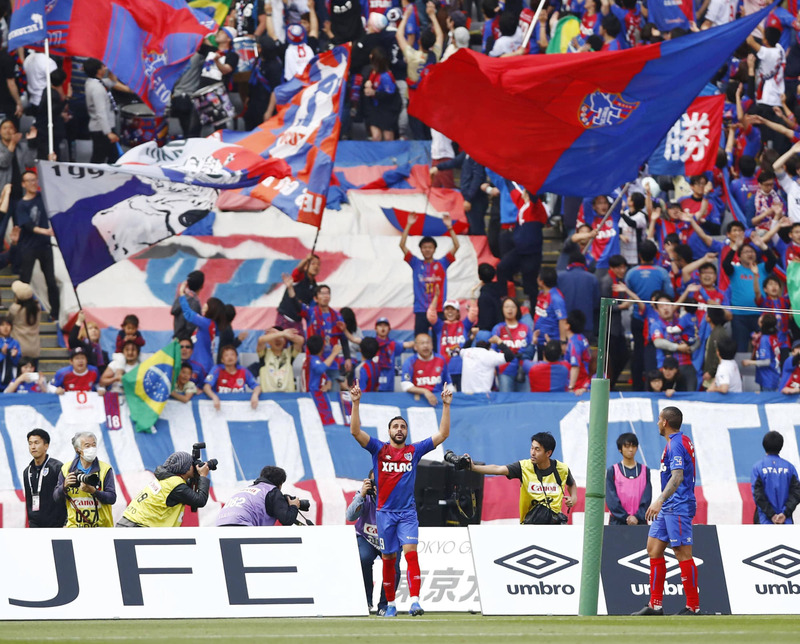 Saturday was not that day for undefeated FC Tokyo or winless Shimizu S-Pulse, as the home side claimed a 2-1 victory at Ajinomoto Stadium on goals from Korean newcomer Na Sang-ho and Brazilian talisman Diego Oliveira. Both managers changed up their midfield from the fifth round, with 17-year-old Takefusa Kubo returning to Tokyo’s starting XI in place of Kentaro Omori and Shimizu’s Renato Augusto relieving Yosuke Kawaji. Tokyo laid on the pressure early, earning three corner kicks in the first eight minutes. Shimizu eventually found its footing, with one-time Manchester City trialist Hideki Ishige pressuring Tokyo ‘keeper Akihiro Hayashi on a free kick from distance. A 15th-minute counterattack spearheaded by Oliveira nearly led to the opener, but it was cleared by an S-Pulse defender after goalkeeper Yuji Rokutan found himself caught out of position. Kensuke Nagai, Oliveira’s partner up front, used his speed to contribute to several counterattacks. S-Pulse wasted their best opportunity of the first half in the 26th minute when Chong Tese’s wide-open shot on goal careened off the far post and bounced back into play. It was indicative of many promising chances for the visitors that did not come to fruition. Less than two minutes into the second half elapsed before the visitors took advantage of a defensive lapse, with recent Samurai Blue call-up Koya Kitagawa slamming in a cross. Tese nearly made it 2-0 in the 50th minute, but he was not able to get enough of a connection on his swinging-half volley which nevertheless forced Hayashi into a leaping save. A minute later, the big man again forced Hayashi to come off his line and dispossess the former North Korea international with a strong tackle. Hasegawa brought on newcomers Na Sang-ho and Jael to switch up the attack in relief of an unimpressive midfielder Yojiro Takahagi and Nagai, respectively. 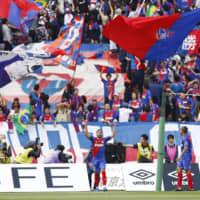 It was the former, who joined Tokyo after taking MVP and top-scorer prizes in last season’s South Korean second division, who brought Tokyo equal in the 76th minute when he deftly met Oliveira’s cross at point-blank range. With less than five minutes left, it was at last Oliveira’s turn to find the back of the net, expertly handling Jael’s pass from behind and lofting the ball over Rokutan and across the line for what would turn out to be the game-winner. The 30-year-old Jael, who joined Tokyo from Brazil’s Gremio has recorded one goal and one assist in 56 minutes of play thus far this season in three substitute appearances. At Sapporo Dome, Oita Trinita earned an impressive 2-1 win away at Consadole Sapporo, with Noriaki Fujimoto scoring the opener in the second minute and each team netting an own goal. At Yurtec Stadium, Ryo Germain, Shingo Hyodo and Ramon Lopes scored for Vegalta Sendai in a 3-0 win over woeful Sagan Tosu, who were without star striker Fernando Torres for a second straight week. At Edion Stadium, Sanfrecce Hiroshima dominated in a 3-0 victory over Gamba Osaka. Yoshifumi Kashiwa and Kosei Shibasaki netted in the first seven minutes, while Hayao Kawabe tacked on the team’s third goal in the 85th minute. Hiroshima ended the day on top of the table with 14 points, leading Tokyo on goal difference. At BMW Stadium, Jubilo Iwata capitalized on an own goal and a stoppage-time goal by Rodrigues for a 2-0 win over host Shonan Bellmare. At Sunpro Alwin Stadium, last year’s second-division champion Matsumoto Yamaga recorded a 2-1 victory over visiting Vissel Kobe, which lost Spanish star David Villa to injury shortly before halftime.